Cinco De Mega Rewind May 3rd. 2019. 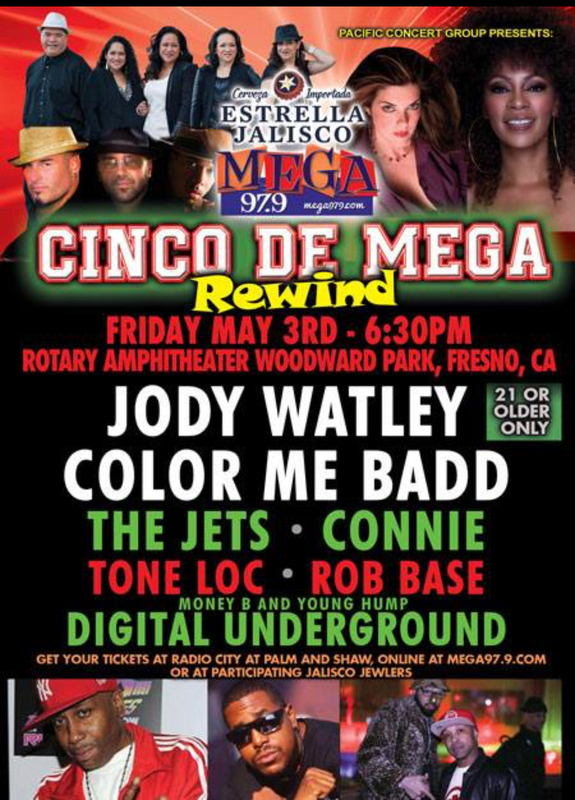 Pacific Concert Group Presents: Cinco de Mega Rewind. Friday May 3rd. 2019. 6:30 pm. Rotary Amphitheater, Woodward Park, Fresno, California. Featuring: Connie, Jody Watley, Color Me Badd, The Jets, Tone Loc, Rob Base, Money B. and Young Hump – Digital Underground. 21 or older only. Sponsored by Mega 97.9FM and Cerveza Estrella Jalisco. Mark your calendars!